Paint with natural watercolors and acrylics. Rebelle is a one-of-a-kind paint software that lets you create realistic watercolor, acrylic, and wet and dry media artwork, using real-world color blending, wet diffusion and drying. The unique watercolor simulation was created by artist Peter BlaÅ¡koviÄ, who sought to fulfill his vision of a digital paint program that mirrored the physical world. 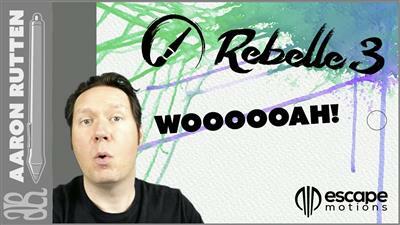 Rebelle is for everyone who wants to use the latest groundbreaking digital painting technology! Beginners can use it to learn and explore the creative world of watercolors and arcylics while traditional painters and computer graphic artists can explore and broaden their artistic repertoire. Sit back and enjoy the beauty of Rebelle software in this wonderful speed painting video by Tim Shelbourne. – Iterative Save – Save sequentially numbered versions of an artwork with â_1â and increasing by 1 for each sequentially numbered file. – Image file thumbnails – You can see the Rebelle image file thumbnails in every file browser or file dialog together with an image preview when available. Available now, Version 3 of Rebelle brings you even closer to blurring the lines between traditional and digital painting through advancements in its watercolor brushes, mimicking its behavior on various types of paper surfaces, and so much more! Hereâs just a sampling of whatâs new. Watercolors are an âaliveâ medium. It can behave differently according to how itâs used and the surface to which itâs applied, especially watercolor papers. Rebelle 3 adds support for a number of professional watercolor papers in addition to the existing textured paper backgrounds. Rebelle 3 includes a new âDropEngineâ to better simulate and control drips and to connect it with the improved watercolor simulation. The engine also allows for the drips to be controlled by the paper type and other factors to produce the most natural look for your work of art. Reference image panel was one of the most demanded features from current Rebelle users. This panel will serve as a visual guide while you paint. You will be able to place the panel anywhere on the screen, docked or floating, and open a reference image, sketch or photo into it. You can zoom in/out the image or desaturate the image with âGreyscaleâ button. In addition, Rebelle 3 will feature another new panel which is very useful for all artists no matter their style. Preview panel is very practical when you work on detail but you donât want to zoom in & out all the time to see the whole picture. This panel can be set to fullscreen mode and placed on a secondary monitor, so you have a nice large preview of your painting. Intel i5 or equivalent AMD processor, 4GB RAM, 200MB hard disk space, graphics card with 1GB RAM, WindowsÂ® 7 (64-bit) and up.